MajinPhil’s stream overlay. Note the timestamps on the left where we keeps track of his time throughout segments of his speedrun. MajinPhil is a Twitch streamer and speedrunner of Majora’s Mask (100% and any%), and he generously made himself available for an interview with us. His opinions and insights into speedrunning were vital to the formulation of this article. You can check out our full interview below. At first glance, the fast movement and frame-perfect tricks within speedrunning seem like the major barrier to becoming a good speedrunner. These impressions are correct, to an extent. MajinPhil notes he spent a while learning the 100% Majora’s Mask speedrun in chunks: first optimizing the main temples within the game, and then putting the route (i.e. the pathway taken to complete the game) of the game together, with the temple portions falling into place. This particular speedrun involves tough tricks such as the use of bombs to make Link hover in midair and reach certain areas: ‘bomb hovering’ involves using bombchus (while another glitch called the ‘infinite sword glitch’ is active) and backflipping, along with other inputs, repeatedly to make Link hover. Another example in Super Mario 64 is called the ‘BLJ,’ or ‘backwards long jump’, which involves using many long jumps repeatedly to gain speed and shoot through walls to different areas of a map. Tricks such as these involve precision and practice, and many such tricks, inputs, or movements are often necessary in order to speedrun a game. 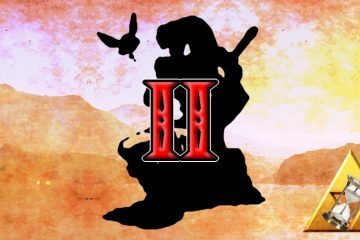 It is evident that these maneuvers require practice; and such practice, as well as learning the route involved to speedrun a game, will take time and present a barrier to new players. Bomb hovering in Majora’s Mask. Backwards long jump in Super Mario 64. However, once players learn these tricks and the movement of a game, they don’t immediately shoot to the top of the leaderboard. Why not? That’s because another, more nuanced barrier exists: mastering the mental game of speedrunning. You might expect that speedrunning is all about just having physical, technical precision, but it actually depends heavily on mental game: a speedrunner’s strong understanding of himself/herself (i.e. their thoughts and emotions) and of the game. In order to understand the mental game of speedrunning, we will need to understand what or whom players feel they are competing against while speedrunning. Speedrunning is a chimera of different aspects of competition: competition with other players, with oneself, and with the game one is playing. Although competition with other players is not very common in speedrunning, competition with oneself requires runners to battle with fatigue, focus, and nerves while performing the many movements and tricks of a speedrun; competition with the game requires players to have a steadfast attitude in the face of forces out of the player’s control. Altogether, players must understand and overcome these mental aspects of speedrunning in order to succeed. Before we further discuss speedrunning, we must think about the definition of competition. With what or whom is the player competing while speedrunning a game? Most definitions of competition involve a contest between two independent forces, often combating against one another to achieve or attain something. However, competition doesn’t simply have to be between two people or teams battling: these “independent forces” could be a person competing against themselves, or they could be something else entirely. Furthermore, this “contest” doesn’t need to involve direct violence: it can instead involve indirect forces, such as simply comparing oneself to others. With this definition, speedrunners are subject to three main competitive forces. Speedrunners can compare their own times to others on a leaderboard, and thereby compete with other players. Runners also compare their times with their past performances, and often while speedrunning a game will have their previous times viewable; thus, runners also compete with themselves. Finally, runners must overcome the mechanics of the game, whether these mechanics are random or predictable; so, runners are also competing with the game itself. In other forms of gaming, such as professional gaming competitions called Esports, there is direct competition between (at least) two players since they can interact and affect each other’s performance. In such faceoffs, such as a 1v1 battle in Super Smash Bros. Melee, spectators and analysts often note the mental game of Smash: it is not just the technical skill or game knowledge that leads a player to the top, but also their mental ability to adapt, learn, and read other players. In these settings, it is well noted that mentality and mind games are key to the success and failure of players; in speedrunning, however, such a point may not be as obvious. 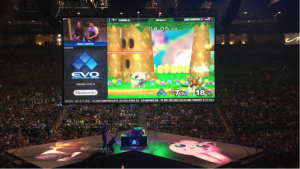 The grand finals of Super Smash Bros. Melee at Evo 2016, a fighting game tournament. Unlike most Esports, most speedruns are single-player endeavors; because of this, one player cannot directly affect the performance of another, and so any player-versus-player competition that happens must instead be indirect. For example, one player may seek to beat another player’s time or generally want to ascend the leaderboard, and so competition may arise in the form of comparing oneself to others. Although opinions may vary across the speedrunning community, speedrunner MajinPhil notes that competition usually doesn’t manifest strongly in this way. Players will share new strategies or glitches within a game so that there is an even playing field; everyone is given the tools to reach their best potential. In other words, speedrunners prefer to collaborate instead of tear each other down, and thus we must look into the other competitive sources in order to fully understand the mental game of speedrunning. 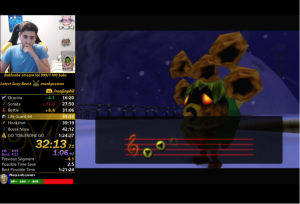 To think about a speedrunner’s mentality during a run, let’s consider a hypothetical situation: a Majora’s Mask speedrunner is on pace to get a personal best after practicing for months, and they are closing in on the final moments of the game. What kinds of pressure is this runner feeling at this moment? One major feature of speedrunning is that players are timing themselves and thus constantly comparing their current performance to their past, and best, performances. Runners are trying to detect and improve upon their previous times, and so their personal bests can be perceived as landmarks to overcome in order to improve themselves. In this way, speedrunners are competing with themselves. In competing with themselves, there are many factors on speedrunners’ minds as they try to keep up their pace. First is the idea of endurance—often mental endurance, specifically. MajinPhil notes the importance of endurance during a 5-hour Majora’s Mask 100% run: “By hour 3 or 4 I’m dying, I’m mentally checked-out…and you really have to build up that endurance, because endurance is half the battle honestly. If you get really good at keeping focus for the 5 hours you can play super well during the end game. Oftentimes when people make mistakes during the endgame it is because of their endurance not holding out until the end.” Here MajinPhil brings up an important point. While speedrunners can get good at the tricks or movements throughout a run, another danger manifests during the course of the run: fatigue. Such fatigue could come from one long speedrun, as in our hypothetical example, or from doing many short speedruns in quick succession. For this reason, it is important to stay mentally focused to prevent oneself from getting too distracted or giving up. 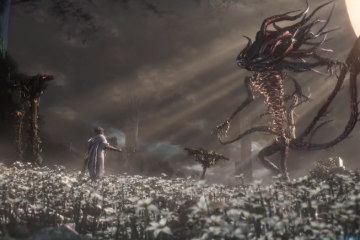 Beyond the need to cultivate endurance, speedrunners also have to perform tricks, exploit glitches, and make precise movements that often require frame-perfect inputs. Even though players spend plenty of time practicing these inputs, during a run they may mess up due to lack of focus or just fatigue, as mentioned above. MajinPhil prefers not to think about the tricks as he is doing them, and one way he does this is to look at his Twitch chat while he’s streaming. He notes, “I find…every time I think too much about a trick it goes wrong, I mess it up, every time. That’s because I’m thinking too hard about it and I don’t let my muscle memory do the work.” He finds that the best way to perform is to use distractions to help keep his attention away from the precise inputs, because thinking too hard about them can become stressful and lead to lapses in performance. While other runners may have a wide variety of strategies, MajinPhil’s point underscores the idea that speedrunners are constantly engaged in a mental battle with themselves to maintain their consistency in performing a speedrun. These strategies represent the solutions that many runners have found to the mental puzzle of competing with themselves, their own doubts, and their limits during a run. Example of a bomb clip used in Super Mario 64. Although this can become second-nature for speedrunners, it can be easily messed up during a run. One last piece to a speedrunner’s battle with themselves is the struggle with nerves. Returning to our hypothetical example, a speedrunner may often feel especially nervous or anxious when approaching the end of a run. They are scared of “choking” away a run after many attempts. MajinPhil notes that this is another major challenge that speedrunners must overcome: dealing with losing a possible personal best, or even world-record-pace run. In MajinPhil’s mind, “If you lose it, you lose it,” but losing something you worked hard for can still make it difficult to keep a positive mindset. A unique feature of speedrunning is the precise keeping of time: players have ‘splits’, or time markers, for different sections of a game in relation to their personal best, allowing them to know immediately when they are performing sub-optimally and losing time. Such a resource can be both a blessing and a curse: speedrunners are constantly comparing themselves to their best times, and this can add to the stress a player feels during a run. For example, when players view their times during a run and realize how far behind they might be when compared to their personal best, they may stop and reset the run. Again, such a resource is useful, but it can also push players to constantly search for perfection, which can cause them to feel stressed out and fatigued. Overall, in the battle with themselves, speedrunners must maintain focus within runs and across many runs of the same game over and over again, keeping a positive, steadfast attitude—lest their negative mindset cause them to crumble. We’ve seen that speedrunners are in a battle with themselves during a run, which can manifest itself in many different mental scenarios that need to be understood and overcome in order to succeed. But speedrunning also incites an entirely different form of competition: competition with the game itself. The nature of this kind of competition can vary based on the particular game or even on the specific player running it. For example, in many games there is significant influence from ‘RNG’, or luck-based events (‘RNG’ stands for ‘random number generator’): in such games, speedrunners can feel like they’ve been playing flawlessly, but, in the end, they don’t end up with the time their performance deserved because some random, deleterious event occurred within the game that they could not control. 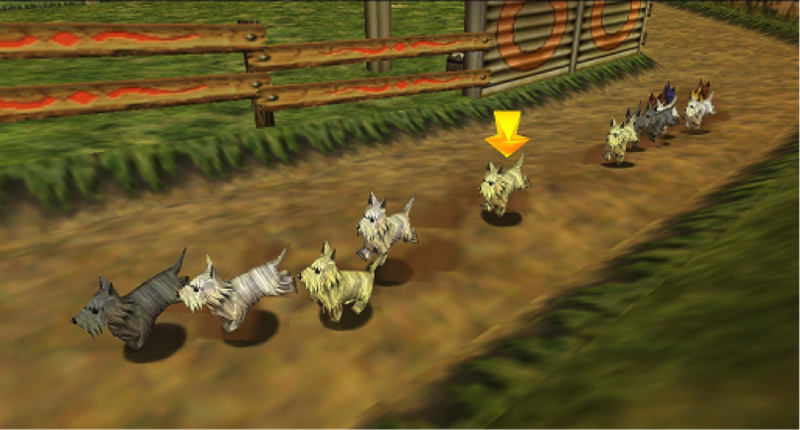 In Majora’s Mask, one RNG dependent event is selecting a dog to win a race. There is a certain dog that runners check to see if it will win (based on the dog’s dialogue), and they will have to reload the area until they are confident this dog will win the race. Examples of RNG range from the random attacks chosen by an enemy in a Pokémon game, to something as seemingly minute as the direction in which coins fly out of enemies killed in Super Mario 64. MajinPhil notes, “you have to go in there knowing that [the game] is going to screw you over sometimes.” Phil explained that, when he’s speedrunning Majora’s Mask any% (i.e. beating the game as quickly as possible by any means, including use of glitches), he feels like he’s competing with the game. In contrast, when he’s running Majora’s Mask 100% (i.e. completing the entire game), he’s competing more with himself than with the game. Both runs have the same total number of luck-based events, but the any% run occurs in a much shorter time span; so, during the any% run he feels like he is competing with the game because of the higher concentration of events that are out of his control. Phil also explained that his time for his any% run is more optimized than his 100% time is. This underscores the point that, as speedrunners get better times and so have less buffer time to lose during a run, their runs may also be increasingly at the mercy of either the mechanics of the game or RNG. This observation speaks to how difficult and potentially disheartening it is to speedrun games at the highest level; for example, the more a speedrunner works hard to get a more optimized, stringent time, the more often they may lose a run because of random forces that are out of their control. Thus, another piece to the mental puzzle of speedrunning is that players must recognize what they do and what they do not have control over. In our hypothetical example, it may be the case that a random event during the final moments of the game causes the player to fall behind and lose their world-record-pace run; this player will need to cope with the fact that there wasn’t anything he/she could have done, and to move forward with a positive attitude. Players need to learn the ways they can improve themselves, and to recognize situations in which self-improvement may not be enough because of luck or other forces within the game that are outside of their control. However, the race for improvement gets harder as the player develops. The more a player’s performance becomes optimized, the less they may have control over. For example, as a speedrunner further understands a game and improves their time, any subsequent improvements in their performance will become more minuscule. The game itself may prevent the speedrunner from improving their time any further, at least given the player’s current route for the game. Speedrunners spend a lot of time competing with themselves, and sometimes with others as they race for their best completion times; in the end, however, the ultimate lurking force is often that of the game itself. Although the barrier of learning the movements and tricks of a speedrun may present an initial problem to players, a more significant roadblock arises from the mental game of speedrunning. The mental game of speedrunning is nuanced and reveals the mental struggles that players have, both with themselves and with the game. These difficulties accumulate as players optimize their runs, but such a struggle only serves to make speedrunning that much more impressive. As evidenced by the many amazing and optimized speedruns for countless games, there is an art to speedrunning a game to its maximum potential, and for reaching the best time a human can perform. 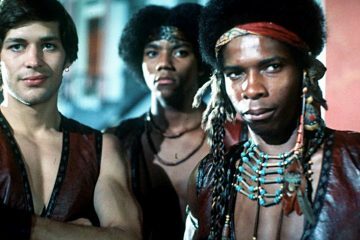 People will compete both with themselves and the game until they can compete no longer, and it is this drive that helps breathe new life into video games. The goal of a 100% run is to complete every part of the game. The goal of an any% run, in contrast, is to simply to beat the game, without needing to fully complete every part. For example, if a game runs at 30 frames per second, a runner has to input something in a 1/30-second window. ‘Losing a run’ means that a runner is on a good pace during a speedrun, but due to some mistake (or other deleterious factor) the runner gets so far behind that they decide to abandon their speedrun.